Artwork by Zsudayka Nzinga on Display at Yoga Heights | Park View, D.C. 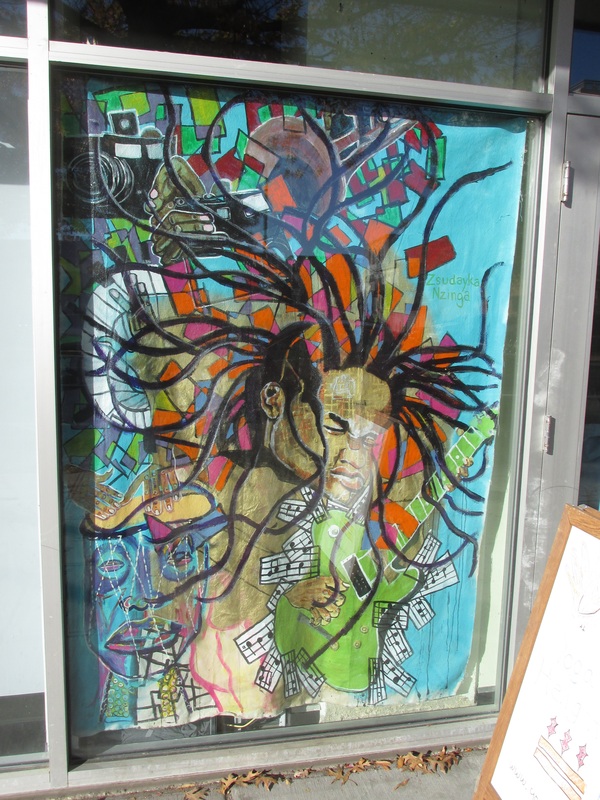 If you missed the November 9th Georgia Avenue Window Walk and haven’t been by Yoga Heights, you probably haven’t seen the artwork by Zsudayka Nzinga that is in the windows at 3506 Georgia. I’m including them with this post, but they are hard to photograph and are worth seeing in person. You can learn more about the artist, her bio, and see where her artworks are displayed, at her Web site. The Web site also has other images of Nzinga’s work. I’m not entirely sure how long these murals will be on display, but I hope it will be a while. I also heartily support the increasing amount of public art we are seeing in the neighborhood. Below is another image from the murals at Yoga Heights. This entry was posted on November 19, 2014 at 7:01 am and is filed under Art. You can subscribe via RSS 2.0 feed to this post's comments.